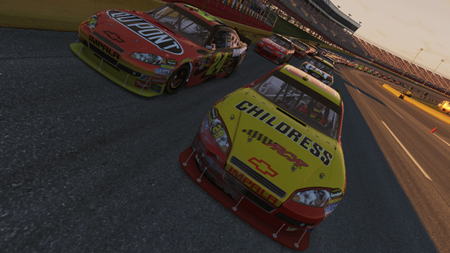 If you’ve followed our Race Day Open Threads, you’ve seen the hype we’ve placed on NASCAR The Game 2011. After nearly three years without a proper NASCAR title, fans finally have a new game, with a new production team, as Activision and Eutechnyx take over for EA and Tiburon. Some of us wanted to believe this would be the second coming of NASCAR Racing 2003, or for others, NASCAR Thunder 2004. The team behind N2011 certainly had the pedigree to to live up to that standards, but did they succeed? The answer lies after the jump! Let’s start with what’s good about the game. For one, at least when the cars aren’t damaged, they were rendered pretty well. Sure, there’s no way they could live up to those in Gran Turismo 5’s, and there are quite a few decal nitpicks I have. But as an overall critique, the team did a good job with the base models. I’m looking forward to seeing how the 2011 models look when that patch is released at the end of the month. As far as the other graphics go, the tracks look decent and are up to date as possible with the 2010 season. The user interface is nice, although it suffers from the same problem that other games have in recent memory. It assumes that everyone playing is playing on an HDTV (and I’m not), and not including an SD mode, thus making the text for tube televisions tiny and almost unreadable. It’s not like I need to see how far I am behind the leader or how much fuel I have remaining, right? For the most part, the sound is what you’d expect. The menu music, especially opening with ZZ Top’s “La Grange”, isn’t bad at all. The soundtrack has with only one subpar song. The cars sound as they should, although when pulling out of the pits for qualifying there’s a weird skipping in the engine.The biggest issue here is the spotter. In the Days of Thunder review, I ragged on the voice work as being bad, but at least Rowdy Burns was INFORMATIVE. Ty Norris? Not so much. He’s about 4 seconds too late when it comes to cars being on your door, constantly says “clear” when you have a lead of any amount, and the absolute worst part lies in his CONSTANTLY lamenting about his food issues, talking about choking on cocktails, dropping hot dogs, and buying pizza. These lines are repeated about three times each, IN A 15 LAP RACE. Just horrendous work here. As far as core gameplay goes, the game is solid. Not hardly Gran Turismo good, but I thoroughly enjoyed myself. It’s not nearly as terrible as Days of Thunder which was all about finding new and exciting ways to screw you over. Bristol and Daytona, as well as the road courses, have their moments. With Bristol, there is absolutely no way to avoid the turn 4 wall, and sometimes, sliding against it bounces you into the air, stops all forward momentum, and sends you across the track in one of the game’s more laughable moments. The main issue here is the rubber band AI. For one, there’s just no middle ground when it comes to difficulty. 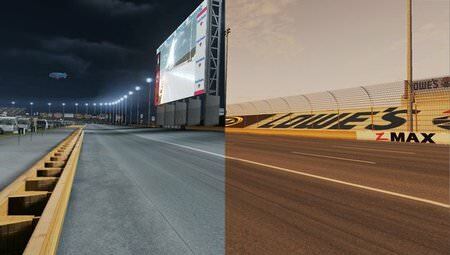 If you play on Easy or Medium, prepare to win nearly every race, save Daytona, with at LEAST a two-second lead. 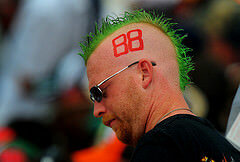 Even Talladega. Hard mode? You’ll never even touch the end of the pack. Maybe I’m just too spoiled by NR2003’s difficulty sliders, but not having that middle ground is simply ridiculous. Add in that the AI drivers just don’t have any aggression to them except Daytona, where they will actively screw you over any chance they get, and you get one of the biggest disappointments about this game. If we stopped there, I could happily rate the game a B- and end the review. But no, you see, there’s far greater disappointment to be had. For one, the paint shop is one of the worst I’ve ever seen in a racing sim. Designs are needlessly hard to place, much less line up correctly on the other side of the car. Only having 5 font options for numbers is laughable. The lack of headlight/taillight decals is just wrong. Oh, and speaking of this lack of decals? Only having a small amount of sponsors, and not even having the freakin’ Sprint Cup contingency logo, is frankly stupid. The image you see above is the best I could churn out with this thing. And then, there’s the damage model. Remember how I slightly praised the base car models? Well, all that goes out the window when you get damage. This is one of the most underwhelming, and inconsistent, damage models I have ever seen. For starters, if you damage any part of the side, it damages the entire side of the car. I’ve had moments where I drifted the car a bit, smacked the wall with just the rear of the car, and then changed views to find that even the front part of the side was damaged. And not just “slid against the wall” damaged, I mean, “pieces hanging off” damage. When I said inconsistent, I meant it. One of those images is the aftermath of a full speed, head-on collision with the wall, that even made my car go off the ground for a couple seconds. The other is the aftermath of simple bump drafting. Can you tell which is which? Well, in the tradition of old shampoo commercials, if you can’t tell, why should I? Add in that computer controlled cars get ZERO damage no matter how hard they hit (I saw David Ragan once flip 12 times, and then drive away, with no damage), and you just get a horrible horrible excuse for a model. And the game is just so full of glitches. There’s the Bristol wall glitch, a glitch that causes drivers who aren’t Carl Edwards to do backflips (Yes, Mark Martin and Bill Elliott do backflips), ones that cause MASSIVE pileups on pit road, make cars and tracks disappear during victory celebrations, leaving your driver floating in a weird blue mess of a world, and COUNTLESS freeze-ups that force you to hard-reset your PS3. It’s as they didn’t even care to bug test the game. Eutechnyx has been working on fixing the aforementioned problems, and plan to release a patch on May 9th, along with the 2011 DLC, but therein lies a major problem with game companies these days. The “release it now, patch it later” mentality that’s come with the ability for gamers to download content to their consoles. This game and so many others that had such high hopes for, is a victim of sheer laziness. They should have delayed the game until they fixed all the bugs. But that even invites a more problematic issue: The game WAS delayed an extra month for the fixes. And if these bugs still got through, I shudder to think how bad initial release may have turned out. I really did want to love this game, but as it stands now, it’s a massive disappointment. Sure, you could say “it’s their first attempt at NASCAR, so cut them some slack”, but that really doesn’t hold any water. A large portion of the Eutechnyx team worked on the old Papyrus NASCAR games, and while they had their problems, they were still very good. So no, it’s not their first attempt, and I’m not cutting them any slack. I’ll certainly give the patch but as the game stands now… Don’t get it. Brett and I share pretty similar views of NASCAR The Game 2011. It treats itself as a racing simulator but plays too much like an arcade. Gameplay treats the draft like a mystical power-up when it really shouldn’t make a difference at tracks like Martinsville and Bristol. On post-race cutscenes, Mark Martin and Todd Bodine should never do backflips. In regards to gameplay, somehow, bump-drafting at Daytona and Talladega equates to the total-damage witnessed in the images above. It makes no sense that I’d have to turn off damage in order to draft. How else am I supposed to compete?! The game also allows you to corner-cut on road courses with no penalty. I once went 43rd to first on the last hairpin at Infineon thanks to a corner-cut. That’s a hoot. If looking at the game from an arcade-style perspective, it gets a B- with room to improve following the downloadable patches. The base is here for a great follow-up. Let’s just hope the developers don’t rest on their laurels.